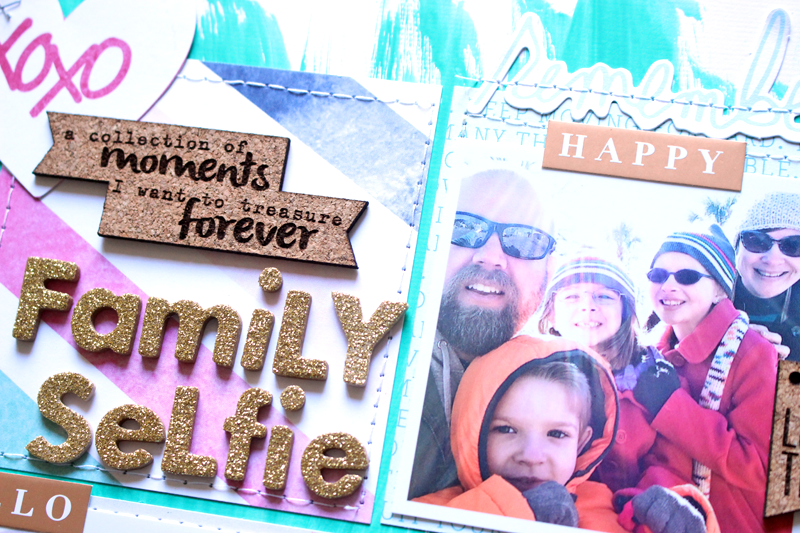 Ashley Horton Designs: Family Selfie & a Process Video! One of my go to designs, has to be a grid! They are so fun to put together, especially when you have so many awesome embellishments included in your Hip Kits! 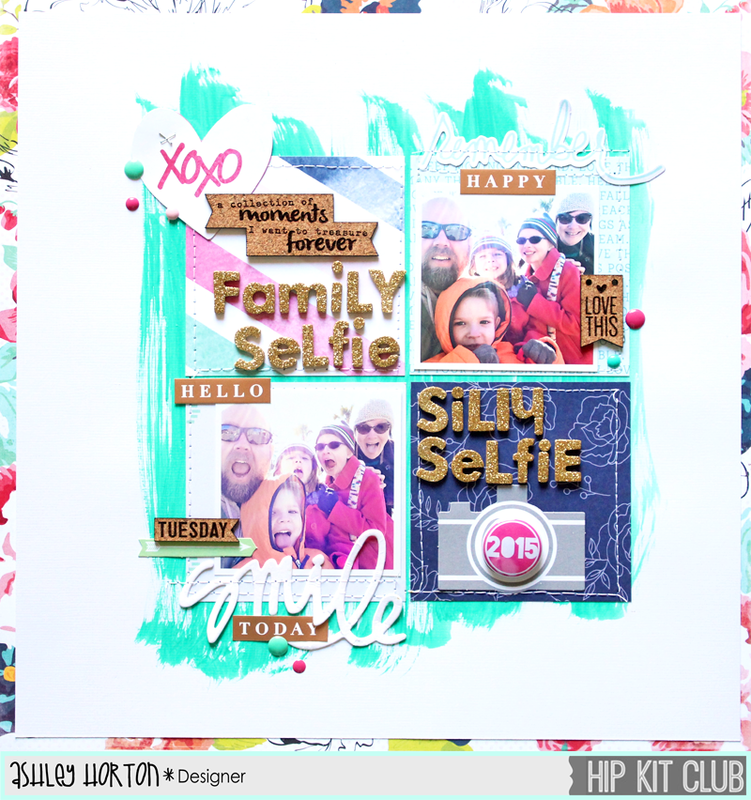 I used the January 2015 Hip Kit & Add-On Kits, to create this grid design for my layout. I've been wanting to use the gorgeous floral paper from Heidi Swapp, and I thought it would make a perfect mat for my White cardstock, and blend in really well with the colors I used on my page. Before adding my papers and photos, I used some water color paint in the background, to bring in the Teal color from the Heidi Swapp paper. I really like the way it made my papers and photos pop, once I added them to the page. I used a mix of Dear Lizzy and Amy Tan papers for my grid squares, and then off set my photos, and title. I think the Fox Thickers are one of my favorite Gold alphas ever...I've had several packs of them!! I also wanted to add some texture, with the flair from A Flair for Buttons and the Cork Embellishments from Elle's Studio. 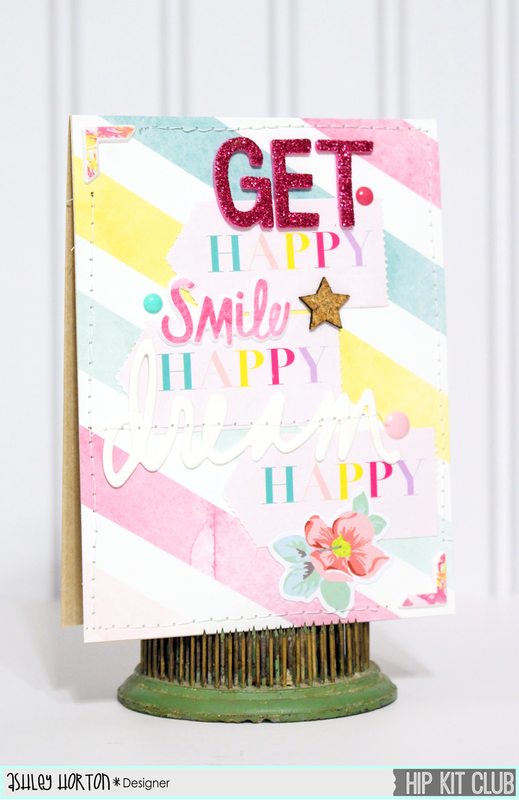 What's more fun than a Happy card, using your January 2015 Hip Kit & Add-On Kits!! The Dear Lizzy tags in the January 2015 Embellishment Kit, are perfect for creating a fun sentiment for your card. I added three of the Happy tags, and then layered Thickers, puffy stickers, and one of the Dear Lizzy Die Cut words to embellish my card. And stitching can always add a beautiful hand made look to your cards, so I stitched along the edges of my card. I also can't resist using the cute enamel dots, so I chose three of the different colors, and added them in a visual triangle on my card. 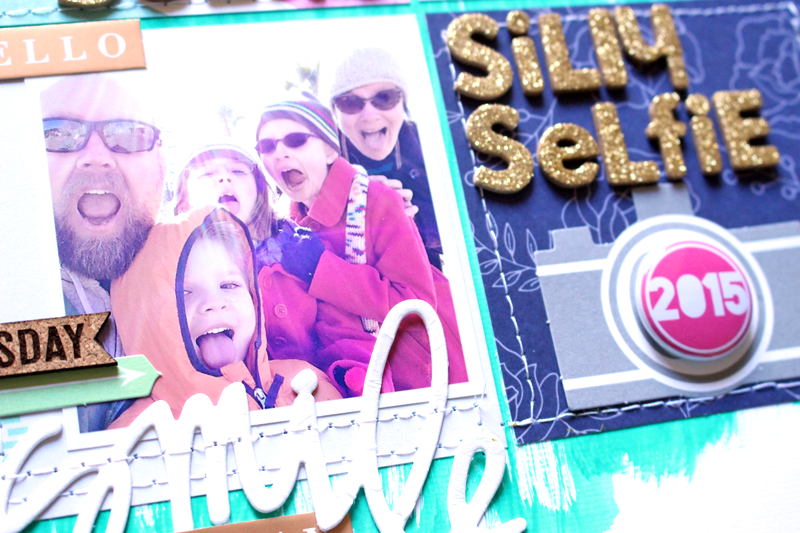 And here is my Process Video for the Family Selfie layout. I would love for you to Subscribe to MY CHANNEL, and receive updates for new videos that are posted!